Every business professional knows from experience when developing strategies to increase ROI from marketing and sales activities that it costs more to win a new customer than to keep an existing one. Less well known is the fact that new customers are not always profitable right away, depending on the costs of acquiring them. Groundbreaking research published by Bain & Company proved that the greatest potential for profit occurs later in the customer lifecycle, when the costs of servicing long-term customers become lower and revenues grow from repeat sales. This eBook outlines the definitive 15 tips to delight your customers and Increase ROI, enabling your company to yield more profit from each customer. You will gain insight into tried and true techniques and combine them with innovative Inbound Marketing methods that ensure your customers become loyal promoters of your company and products. Customers have high expectations when it comes to communications from their vendors. Your goal should be to exceed customer expectations at every turn, because 91% of unhappy customers will take their business elsewhere. Don't be one of those companies with a decreasing customer base. 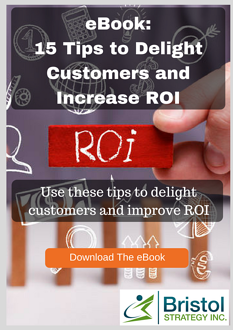 Follow these 15 tips to delight your customers and increase ROI.